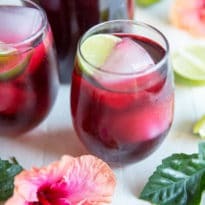 Made from dried Hibiscus Flowers, this Agua de Jamaica recipe makes a tart herbal tea you can serve hot or cold. Sweeten Hibiscus Tea with sugar or honey. In a large glass measuring cup, rehydrate the hibiscus flowers in 4 cups boiling water. Allow to sit for 60 minutes. Strain and remove dried flowers. Stir in the sugar and 4 cups cold water. Serve over ice. Combine 4 cups water and 1 1/2 cups dried hibiscus flowers in a medium saucepan. Bring to boil and simmer until the dried flowers have softened, about 15 to 20 minutes.